A Quick Tour about the EmailTray Email App for Android – Now Available on YouTube! This is not a marketing pitch but rather a video tour introducing the features and settings of the EmailTray mail app for Android. - Full support for POP3 and IMAP (including push notifications). The world of the future, as described in the good old science fiction books, movies and magazines, has already arrived. This brave new world is rapidly changing. In order to succeed you need to be like Julius Caesar and simultaneously do as much as possible. A device that you carry in your pocket and use to read new magazines with your morning coffee, watch movies in the evening and send emails during your lunch, is a usual thing today. An example would be the Kindle Fire from Amazon. Today we talk about Kindle Fire, because the EmailTray development division of Web CEO Limited has been testing the EmailTray mail app for Android on this device. 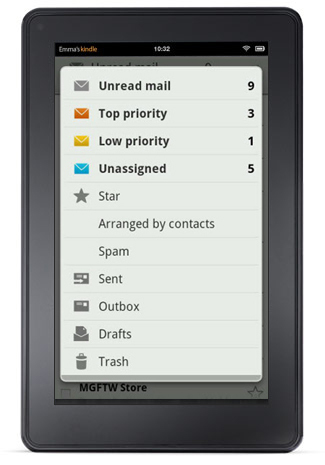 Join us and get all the benefits of the EmailTray mail app for Android on your ereader/tablet from Amazon. EmailTray for Android is a mobile extension of the Windows-based EmailTray for desktops, so there is a smart technology behind it. Unlike other email clients, EmailTray is based on an intelligent algorithm that identifies email priorities and sorts messages into folders according to those priorities. It will also notify you about the number of top priority messages you have via sound, vibration or light and also by means of a screen widget. The EmailTray email client remembers your emailing activity via a server hashtag technology, so you can use the EmailTray email client on all your devices (both Windows- and Android-based) and make your email management the most effective. It estimates email priority based on your past behavior. It sorts emails into “Top priority”, “Low priority”, “No priority”, “Spam” and “Revise” (when priority is in question and you need to manually decide how to the program should treat such emails in the future) folders. It rescues good email trapped in the Spam folder by mistake. A functional widget on the home screen notifies you about the number of priority emails. Access to EmailTray can be password-protected. It supports multiple email accounts, both POP3 and IMAP (including push notifications). It lets you share pictures, music and other content via email easily. You can group messages in folders as you need. 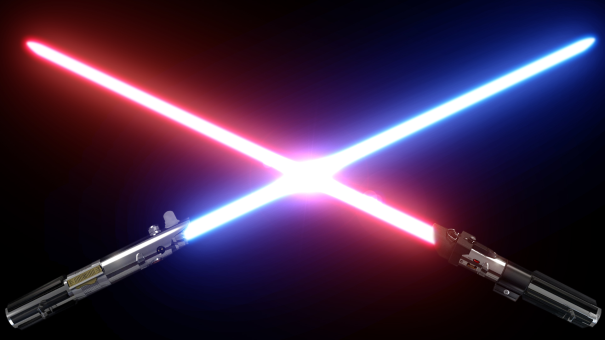 When you use desktop EmailTray both apps synchronize priority assignments. 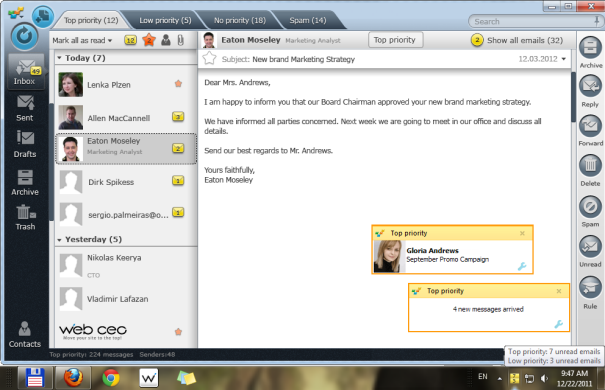 Feel free to tell us what you think about our EmailTray email client. We are always happy to get your reviews and comments. Your prompt feedback helps us to improve our products. 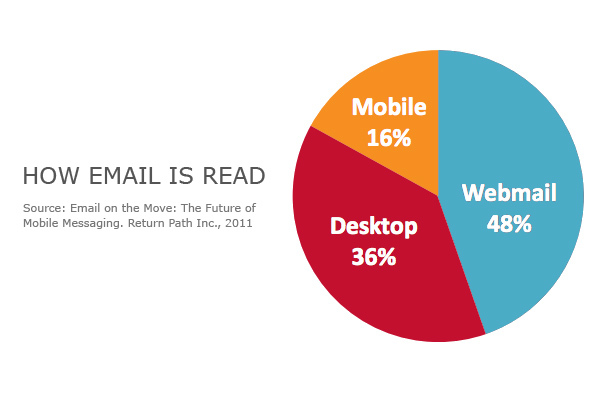 Email is still one of the most popular modes of internet communication, but the sphere of its usage has slightly changed. Nowadays we get information about our friends and family mostly through social networks, whilst email is left for business communications. This business orientation has led to the increased use of email on mobile devices, because in the modern highly-competitive business world it’s really important to be always online and take action immediately with important messages. The comScore research shows that 89.6 million Americans used their mobile phone to access email for work or personal purposes during the three-month average period ending November 2011, growing 28% from the previous year and representing an additional 19.5 million mobile email users. Over half of “mobile workers” check their email on waking or immediately after getting dressed, – discovered May 2011 iPass survey. Nielsen research on what mobile users do online showed email to be the most popular activity, accounting for 38.5% of mobile internet time. Today email on mobile devices is an integral part of doing business. If you manage your email on a mobile device effectively, you may improve your business communications and get constant access to the information you need. When you answer your business emails immediately, you save seconds that create a competitive advantage in our rapidly moving world. Everything changes too quickly so you cannot allow yourself to separate your job from private life nowadays; you will mostly always need to be available via email so as not to lose opportunities. But nobody wants to become a robot that checks its inbox every second like an obsessed maniac. How do you find a balance between your need to read business emails quickly and your desire not to mix business and private life too much? The EmailTray for Android app is the answer. Its main feature is smart analysis of your email communications that helps to sort your inbox (4 inboxes in this case) according to messages’ importance. With the EmailTray for Android app you read only the highest priority emails and do not waste time deciding what messages you need to read and answer first. 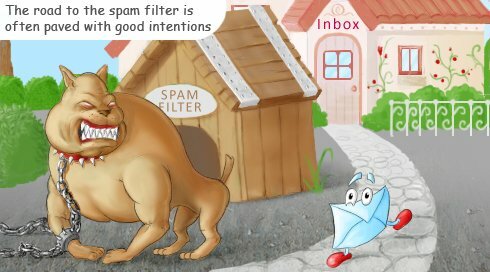 Besides smart sorting of emails, the EmailTray for Android app scans your Spam folder and rescues good emails that may have been trapped there by a spam-filter’s mistake. These features make you confident that all important emails immediately get to your inbox, sorted by sender priority, and ready to be answered. Install the EmailTray for Android app to stay on top of this brave new, highly competitive business world. So you use email as one of the important channels for business and personal communication, receive tens or even hundreds of email messages per day, and get distracted to your Inbox many times a day… For those who practically apply time management principles to their everyday life, it is vital to use productivity tools to conquer information overload – in order to focus one’s attention on important tasks and eliminate unnecessary distractions. So where is the way out? A smart email notifier is definitely the best solution here. - You want to know about each important mail in time, not in a batch only three times a day (which is what some email overload experts have suggested as a strategy). In other words, a good email notifier is supposed to free up your hands and save your time, help you manage email efficiently, let you focus on important tasks and improve your email productivity. 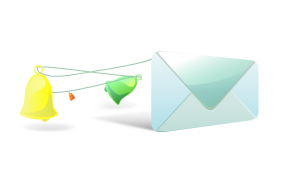 Do you want to get the most out of your email software? Then go for EmailTray, a FREE email client and a smart email notifier which offers you everything you could ever dream about in an email client. EmailTray offers easy and lightning-fast setup: just enter the login and password details for each email account (this data will be stored locally on your PC), and this smart email client will configure everything for you. EmailTray supports all popular Webmail providers (Yahoo! Mail, Gmail, Windows Live Hotmail and AOL Mail), POP3 and IMAP accounts. You are not limited to the number of email accounts to track. With EmailTray, you can read, reply to and forward emails in HTML; open, save and send attachments, take advantage of the instant search feature, manage your contacts and sync them with your Android devices… and more. Thanks to an advanced email sorting mechanism, EmailTray knows which emails you need to attend to first and it does not bother you with each and every email. It will notify you about the top priority emails only with a popup window and sound. 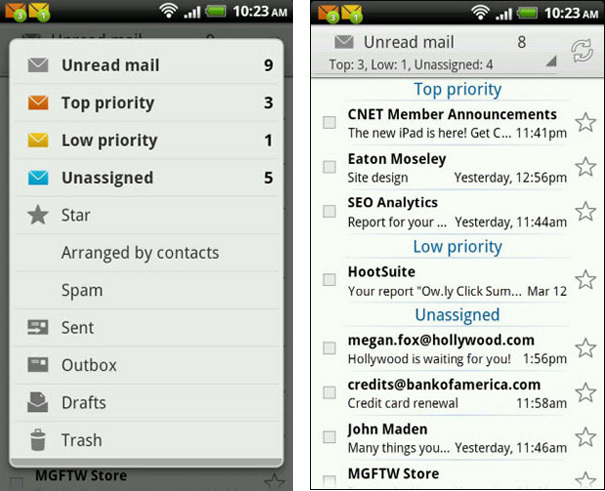 EmailTray software is available both as a Windows email client and an Android email app. In fact using EmailTray on several devices improves the accuracy of email sorting across all your devices, as EmailTray remembers the email actions you applied to each email sender and uses this data for better email sorting. 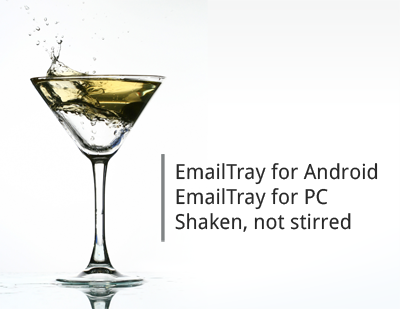 We are proud to announce that now you can use EmailTray on your Android-based devices. 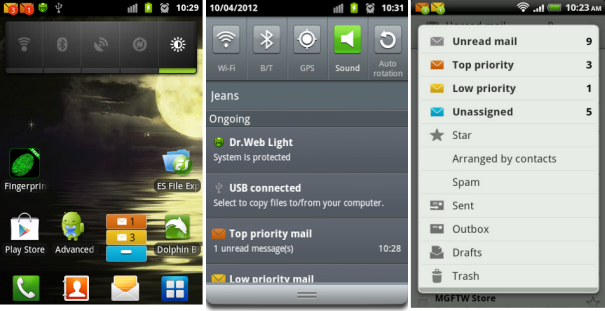 The EmailTray for Android email client app is compatible with Android 2.2+ devices. EmailTray for Android app is a lightweight email client that detects important messages and separates them from everything else. A special smart algorithm is used for this. 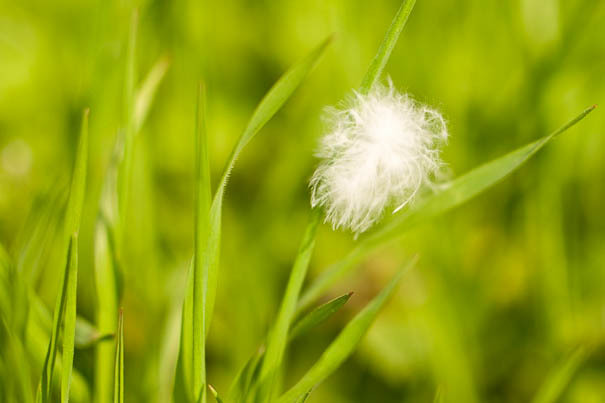 With EmailTray you can focus only on the things that really matter. Your email accounts can be protected with one password. Install our new mobile email client app and have the advantage of the personal email assistant in your pocket. Our Android developer team will be happy to get your reviews and comments, your feedback helps us to improve our products.